Mechanistic studies on Ziegler-Natta catalysis: a methodological reconsideration (T. Keii). Ziegler polymerization of ethylene: catalyst design and molecular mass distribution (L.L. Böhm et al.). The role of ethyl benzoate in high-activity and high-stereospecificity MgCl2-supported TiCl4 catalyst system (N. Kashiwa et al.). Structure, composition and activity of supported titanium-magnesium catalysts for ethylene polymerization (V.A. Zakharov et al.). Ethylene polymerization with modified supported catalysts (S. Lin et al.). Synthesis of EP-rubber using Ti-catalysis (K. Soga et al.). Design of supported Ziegler-Natta catalysts using SiO2 as carrier (A. Muñoz-Escalona et al.). Function of the binary and ternary complexes in the propylene polymerization catalysts (A. Guyot et al.). Studies on olefine polymerization (S. Tang). Supported organometallic catalysts for ethylene polymerization (Yu.I. Yermakov et al.). Chelate complexes of nickel: catalysts for the oligomerization/polymerization of ethylene (W. Keim). Molecular behaviour of soluble catalysts for olefin polymerization, Part I: Ethylene insertion with soluble Ziegler catalysts (G. Fink et al.). Part II: A new type of &agr;-olefin polymerization with Ni(O)/phosphorane catalysts (G. Fink, V. Mohring). Structure of poly-&agr;-olefins and reaction mechanism of Ziegler-Natta polymerization (A. Zambelli, P. Ammendola). Structure and reactivity of `living' polypropylene (Y. Doi et al.). Ligand effects on metallocene catalyzed Ziegler-Natta polymerizations (J.A. Ewen). Preparation of special polyolefins from soluble zirconium compounds with aluminoxane as cocatalyst (W. Kaminsky). Kinetic studies on Ziegler-Natta polymerization: an interpretation of results (P.J.T. Tait). Catalysis and the unipol process (F.J. Karol, F.I. Jacobson). Heat and mass transfer limitations and catalyst deactivation effects in olefin polymerization for gas phase and slurry reactors (S. Floyd et al.). Reaction engineering aspects of ethylene polymerization wih Ziegler-Catalysts in slurry reactors (K.H. Reichert et al.). Approaches to the problem of tacticity determination in polypropylene (D.S. Burfield, P.S.T. Loi). A study on the states of ethylbenzoate and TiCl4 in the MgCl2-supported Catalysts by using thermal analysis (M. Terano, T. Kataoka). Studies on the copolymerization of ethylene and &agr;-Olefins with Ziegler-Natta catalyst supported on alumina or magnesium chloride (R. Quijada, A.M.R. Wanderley). The structural study of supported Ziegler-Natta catalysts for the polymerization of olefin (S. Xiao et al.). A novel multifunctional catalytic route for branched polyethylene synthesis (Yu.V. Kissin, D.L. Beach). The stereospecific polymerization of &agr;-olefins: recent developments and unsolved problems (P. Pinot et al.). Index. 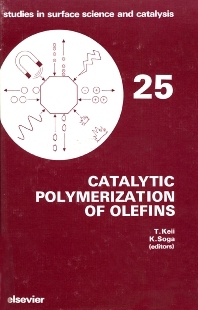 This book covers the proceedings of a symposium which was attended by researchers from all over the world who reported on and discussed recent advances in the field of catalytic polymerization of olefins. Over two decades have elapsed since the discovery of the Ziegler-Natta catalyst. Tremendous research effort has been aimed at improving this marvelous catalyst. In twenty-five years since the first publication, more than 15,000 papers and patents on the subject and on related subjects have appeared. This effort has yielded new generations of Ziegler-Natta catalysts with superior activity and stereospecificity. The complexities arising from the heterogeneity of the catalyst, however, have hindered understanding of the catalytic processes which take place on the catalyst surface. Nevertheless, many fundamental features of the catalyst system have now been clarified reasonably well. Recently a highly active homogeneous catalytic system has been developed, which is capable of catalyzing even isotactic polymerization of propene. There is no doubt that this finding will not only contribute to our understanding of the detailed mechanism of polymerization but also stimulate the development of various kinds of tailored polymers. Thus this subject will remain of paramount importance in the development of chemistry and polymer science for a long time to come.